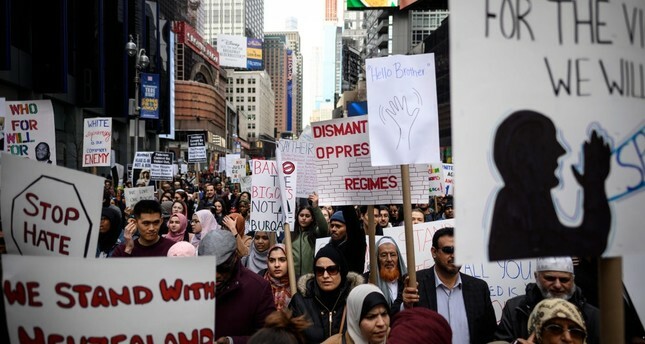 Demonstrators take part in a protest against growing Islamophobia, white supremacy and anti-immigrant bigotry following the attacks in Christchurch, in Time Square, New York City, March 24, 2019. First, a panel on different epistemic notions of Islamophobia will critically examine various assumptions and arguments about the meaning and strategic objectives of the political utilization of Islamophobia, including how the "clash of civilizations" thesis that emerged over a quarter a century ago was the precursor to the current Islamophobic discourse for geopolitical power and control. The impact of Islamophobia on Islamic reform shall also be explored and discussed. In a second panel, scholars will discuss the intersection and divergence between Islamophobia and Orientalism, looking at different formations of the "other" over time, and thus raising the question of what differs between Islamophobia today and other forms of racial "othering," including the important examination of the similarities and differences between Islamophobia and anti-Semitism. Another panel will discuss the role Islamophobia plays in the service of empire building and expansion for political hegemony and economic control. Given the importance of human rights in the international political system today, the relation between Islamophobia and human rights will be discussed, including the role of liberalism and feminism in its justification, as well as how racism has been normalized in the age of Islamophobia. How the current developments and future directions of human rights around the world might evolve will also be explored. Given the often-tilted focus of Islamophobia's consequences in the West, the conference will also have a panel that examines multiple manifestations of Islamophobia in different contexts around the world, including China and India. The important role played by think tanks and right-wing groups in propagating Islamophobia and demonizing Islam and its adherents for geopolitical ends will also be discussed. Finally, a panel that features all the conference's speakers will address strategies and policies that need to be adopted and pursued to curtail or reduce the harmful and detrimental effects of Islamophobia. A major objective of the conference is to bring together leading scholars in their respective fields in order to intellectually engage in thoughtful discussions on some of the major issues related to Islamophobia and to ultimately explore the range of appropriate responses. The conference will commence on Friday afternoon with a distinguished panel that will feature professor Ann Norton from the University of Pennsylvania in the U.S, and author of the renowned book "On the Muslim Question," professor Salman Sayyid from the University of Leeds in the U.K., and professor Selim Argun, the vice president of Diyanet, the Turkish Directorate of Religious Affairs. The subsequent panels over the next two days will not only analyze important and relevant topics and present prescient assessments but will also attempt to present practical solutions to difficult challenges.